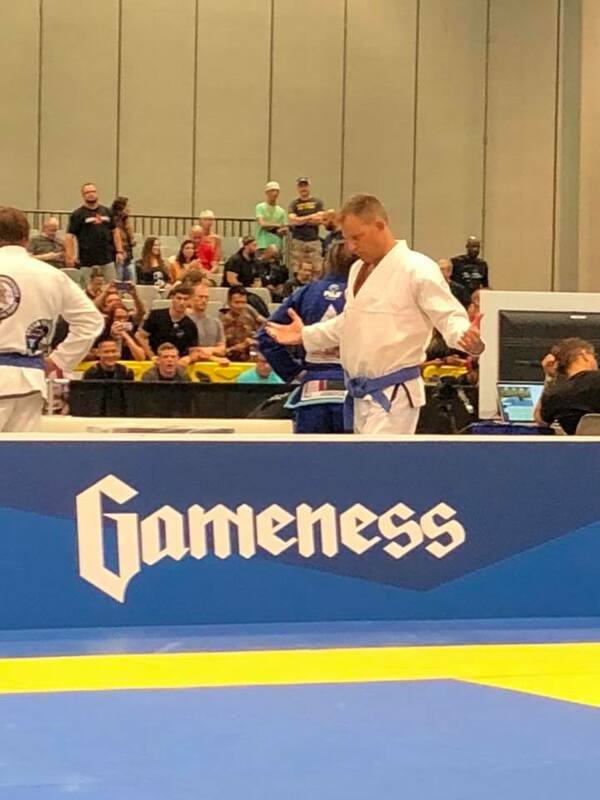 This past weekend was the 2018 IBJJF Jiu-Jitsu World Masters Championships in Las Vegas, NV. It is the largest jiu-jitsu tournament in the world. Thousands of competitors from all over the world converge into the massive Las Vegas Convention Center to test themselves against the very best in the sport. There is so much to see, so much to observe, and so much to comprehend. There are 20 matches going on at the same time for World Masters and then another area of 6 matches for the simultaneously run Vegas Open for adults and children. Four straight days of intense jiu-jitsu competition. You see the best and worst in people. You see incredible amounts of joy and deep levels of sadness. Victory and defeat. Inspiration and confusion. Do the best practitioners always win? What can a person learn from this experience? Who do I want to model myself off of? That last question was one that I spent a lot of time self-reflecting on. Who do I want to model myself off of? Who do I admire and why? Each and every division has a gold medal winner. But they came in all different shapes and sizes. They came in different styles of jiu-jitsu. They came from people with varying personal characteristics. I saw people that won who were not the greatest of athletes. I saw people that won who did not display the best form of sportsmanship. I saw people that won who may have not even been the one with the most technical ability. How does one reconcile these observations? I stepped back and reminded myself of the power of influence. We don’t even realize that we are being strongly affected because of the influence of others. That may include our coaches, our teammates, our friends, our co-workers, our family members or the role models that we choose for ourselves. So I asked myself and interesting question, “Who is it that I would want to emulate here and why?” Would I limit myself to only those that won a gold medal? In jiu-jitsu and in life you’ll come across people that will either be a positive or negative influence on you. Will the person help you maintain an optimal diet? Will the person help you acquire optimum sleep and recovery? Will the person inspire you to be the best version of yourself? Or will these people take you off the path of success? How will peer pressure factor into your decision making? The fact remains, if you hang around with rotten apples, it’s more likely that you become a rotten apple versus you turning the bad apples into shiny crisp golden delicious apples. So I asked myself, “Who am I around?” Who am I associating with and why? Do I surround myself with only gold medal winners that may not be the best positive influences on others? What would hanging around these individuals do to me as time progresses? What would they have me doing? What would I be listening to? What would I be reading? What would I be spending my money on? What would I be eating and drinking? What time would I be going to bed? How would I end up treating others? How would I end up treating myself? I found myself in a fortunate situation. I put myself in a position to associate with people that I want to be like. People that are disciplined. People that are hard-working. People that are motivated. People that have good habits and behaviors. People that are principled. People that are loving, caring, and willing to share and help others. One example of such an individual was Thomas Wortman. Tom works as a civilian for the Department of Defense in the Army division. He’s a forensics expert. He’s motivated, disciplined, hard-working, detailed, and dedicated. He’s the guy who is up early to hit the gym. He’s the guy who will help you improve. He’s the guy that will cheer for you when you win and support you when you lose. He’ll lead by example. He was also a silver medalist at Worlds. He’s brought home hardware from IBJJF Opens, Pans, and Nationals. It doesn’t surprise me. If you saw his work ethic you would say it was well deserved. But what happens when you are around some less than positive people in your life. What do you do then? That’s not an easy decision, but how you handle it will make a big difference in your life. Will you let them sway you to the dark side? Or will you disassociate? Will you limit the association? Will you fall into the trap? In jiu-jitsu, you will come across people of all kinds. You will come across some messed up individuals and you will also come across some highly successful individuals on the mats and in life. When you do come across these individuals, it’s wise to expand your associations with those of quality. Find other successful people to spend time with. Learn from them. Model them. Ask them questions. Let them lift you up and bring you to higher levels of success. Carefully determine who you let influence you. Look for quality people that will build you up and make you a better person. It may or may not be the person who has a gold medal around their neck. Success should run deep within the individual.